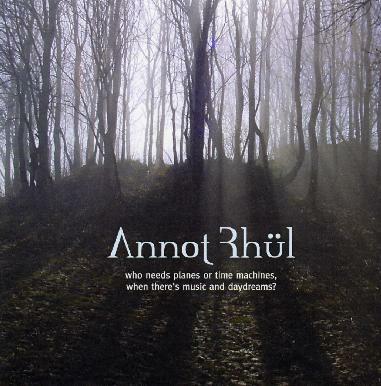 Annot Rhul - "Who Needs Planes or Time Machines When There's Music and Daydreams"
The name sounds a bit like Amon Düül, eh?? Well, the music is somewhat related. This is basically a two man project by Sigurd (AR) and with help from Burt Rocket (Seid). The CD begins with "Mirage", which is a multi-layered all guitar piece and very cool. This leads into "Evergreen Forest", which features Burt on Drums and Annot on all other instruments. It is very much a deep forest space track and quite beautiful and reminds me of Gentle Giant meets Pink Floyd. "Planes or Time Machines" takes off next and is a great instrumental space rock track (a bit like Seid) and features an organ solo by Håkon Pettersen. "Carlos' Brothers" has a great bass line and features a really cool sitar and really reminds me of early 70's Krautrock. A killer song! Next are two short pieces, one a piece of circus music followed by a sort of Spanish influenced surf piece, strangely called "King Arthur". "Knife Valley" has the same sort of pace and garagy sound as "Silver Machine" by Hawkwind. Not sure why that comes to my mind when I hear this track but it does. "The Haunted Mansion" is another moody piece that is nice and spacey. "Aurora Borealis" features some extensive synthesizer loops over which Annot lays down some cool spacey guitar. This reminds me of Tangerine Dream in many ways. "Stung by a Cactus", another Spanish influenced track, finishes off this excellent debut CD by a very creative artist. For more information you can visit the Annot Ruhl web site at: http://www.annotrhul.com.